Entirely non-magnetic for use in the MRI suite. 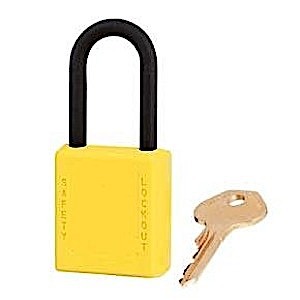 Lock up valuable equipment, pharmaceuticals, and other items of importance with this durable, lightweight, non-conductive lock. Plastic, copper, and brass body with plastic shackle. Key-retaining feature ensures that padlock is not left unlocked. Key is also non-magnetic.